It had been a hard day, running too many errands with two small children. My three-year-old didn’t understand why we couldn’t buy every toy his tiny hands could touch. And he kept getting in and out of the grocery cart, whining when I tried to stop him. I was not a happy mama and wondered how all the other moms in the store seemed to know what they were doing. Their children listened when they told them no and they wore matching outfits, too. I wondered how in the world those women pulled it off with a smile. I could barely get a shower, get my kids dressed and get us out the door before lunch. When we got home that afternoon, I went looking for pink construction paper so I could write “I QUIT” on it and turn in my “pink slip” to my husband J.J. when he came home from work. I was tired of feeling like such a failure as a mom. And in that place of surrender, His peace came over me. His gentleness calmed my nerves. It felt like God bent down before me to listen, and spoke to my heart: You are right, Renee. In your strength and through your perspective, you can’t do this. But with My promises, My presence and My power – all things are possible. I will help you. When we acknowledge that we are a mess on our own, God rushes to our side to help us. He bends down to show us that with His help, wisdom and guidance, we can become the confident praying mama we long to be, and the confident mom HE created us to be! Today’s post from Renee Swope is a partial excerpt from her new A Confident Heart Devotional book. Used with permission from Revell Books. Enter to win one of 2 copies of Renee’s new Confident Heart Devotional book! Share your thoughts and let us know what friend you’d give it to, if you won 2 copies. Winners will be announced Friday! Renee has been married for over 20 years to her husband and best friend, J.J. She’s a mom of three and loves every minute of it. 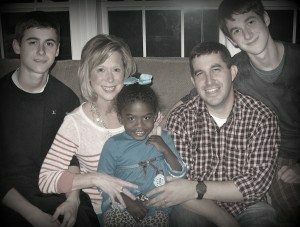 She and her family traveled to Africa in 2009 to bring home their beautiful daughter who they adopted from Ethiopia at the age of 10 months. Renee is also a best-selling author, speaker and radio co-host with Proverbs 31 Ministries. She and her family live in North Carolina where Renee has served in leadership on the staff of Proverbs 31 Ministries since 1995. Connect with Renee on her blog at www.ReneeSwope.com. Do you ever feel like you’re not good enough as a mom? Does self-doubt leave you feeling uncertain about your ability to shape and shepherd the hearts of your children? 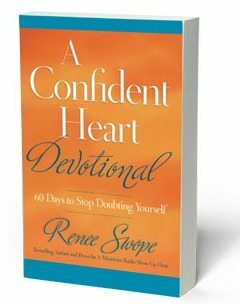 Expanding on her best-selling book, A Confident Heart, Renee Swope has written a new 60-day devotional that will encourage, empower and equip you to live confidently in your God-given roles, relationships, and responsibilities! Each devotion also features a “When I Say…God Says…” statement with a Bible promise and a prayer to guide your thoughts and emotions that day. Plus you’ll LOVE an easy-reference chart that includes all sixty ”When I Say…God Says…” statements for days when you just need a promise to hold onto! PreviousThe First Time He Bit. . . I have had that thought often. My older 2 kids seem to be fighting all the time. It’s so hard. I would share my 2nd copy with my BFF, Dawn. She’s a full time working mom who is so hard on herself. She’s a great mom, but she expects so much of herself. I try to tell her all the time that she’s doing a great job, but I don’t think it gets through. I have feelings of guilt all the time over my shortcomings. I would give this book to one of my friends who is having a baby. Absolutely amazing. Reading this with tears running down my face. I have had those days a lot lately.Overly tired, stressed and having a toddler who’s a little tornado, I find myself asking WHY Me a lot. I have had severe headaches accompanied by blackout spells as well as a fall and hitting my head with the last blackout. I am so tired and trying to take care of a little one, do house work etc is exhausting. Yet it never seems to amaze me how at the end of the day, no matter how crazy the day may have been I can sit down to read my Bible and feel peace in the midst of all the stress and health issues going on. Yes, and there are times with tweens I have the same thoughts – I want to quit 🙂 SO glad that God is faithful. I’d share a second copy with my friend Sherry – who seems as stretched thin as I do some days. 🙂 Thank you for sharing!! I would give it to a friend who is about to have her fourth baby! I frequently struggle with mom-comparisons. I really needed to read this today! I’d love to win a copy of Renee’s devotional for myself and a friend. I think all moms need to know everyone of us feels this way sometimes. I would give a copy to one of my MOPS friends! I feel l like this constantly! The stress of being a pastor’s wife and stay at home mom are tremendous. But God lives to remind us through various ways that we are loved just as we are. I would love a copy and would give the extra copy to my sister in love who is a great example of mothering to me. I have used those words ” I Quit” several times this week, only with my teenage son. 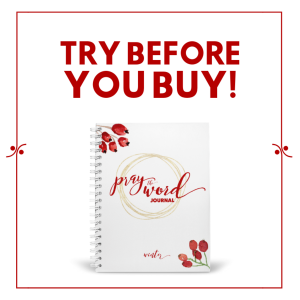 I would give a copy to a dear 17 year old friend who made some poor choices, and has only recently come to Christ, as she sets in the Neo Natal Unit of hospital with Twins born 2 months early. My best friend recently had a stroke at age 36 she has 4 kids and sometimes struggles with the mom she used to be vs. the mom she is today. She is my hero. I would love to be able to give this to her. This would be so encouraging to her…….. We talk a lot about trying to make sure we see ourselves through Gods eyes and not our own! What a great post! Thank you and boy did I need to hear this this morning!! I’m 8 months pregnant, we are moving in two days, we have an 18th month old son who is enthusiastically active (do you like that? 😉 ) and my husband works 10/12 hour days, sometimes graveyards (he just came off of these, he had been working them the first 6 months of my pregnancy. I have been clinging to God and am starting to recognize where my own flesh drags me down in doubt and how Satan whispers constant lies to me just when I’m feeling good about how I am parenting and how strong my faith is. I realize, this is never enough if I am not constantly in the word, reading, praying, thinking and commiting to Christ. I have lost many friendships in the past years due to my belief in God, love and commitment to my children and marriage and I keep hearing the guilt message of “Maybe there is something you could do, change, or be to get those people back so you aren’t alone.” But I know Christ sees me as sacrificing for Him, and keeping him in the center as the most important. I have a sweet friend who I have recently reconnected with. We have done Tim Keller studies together and she is always a text away if I need a prayer. She has two young girls and I have seen her grow in the Lord this past year and knowing that we are apart of each others lives is such a captivating blessing to me. That is who I would share the second copy of the book with if I Won. At this point, its not about winning, I am just thankful for her friendship, and for who God is making her to be. I could have written the above entry myself. How many times I’ve felt that way just this week! I have a sweet friend with two boys of her own who are very close in age. I’d surely share a copy of this book with her! I would give it to my sister-in-law who is a dedicated mom of two boys -one being a special need child – and a wife to a man who has health challenges as well. I have so many friends I’d love to share this book with! I love that she puts into words what we all so often feel but are afraid to voice it. I am an adoptive mom and oftentimes feel like I’m not a part of the ‘real mom’ club and that all the ‘real moms know way more than I do!This excerpt helped me realize that all moms must have those feelings of inadequacy. I believe this book would help me move beyond my thoughts of doubt as a mom. I would most definitely appreciate the book and have a good friend who is also a foster/adoptive mom that I’d love to give this to. This made me cry. 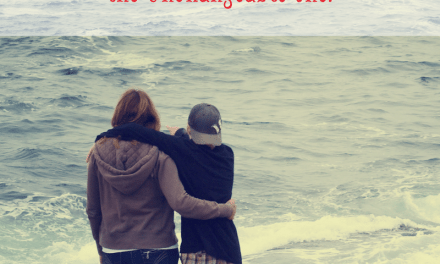 Sometimes I feel like I am the only mom who wants to quit, And not just mothering… sometimes I want to quit life altogether. If I won I don’t know who I would give the book to because there are so many options! I am really struggling this past few days with this and trying to place it before God and lean on His Promises and strength. Thank you for writing these words for us moms who struggle. If I won I would give the book to however God lays on my heart, as I have done so many times in the past. God Bless! I would probably give the second book to the first one of my kids to make me a grandma 🙂 Then they can share it with the other 2. I would give it to my friend Heather. She and I just started blogging and both of us could use a dose of “not doubting”! When I read this post this morning I thought this could have been written about me! if I were to win two copies of this book I would bless my friend Tiffany with one. She has encouraged me in so many ways and I know she would be blessed and encouraged by this book. Thank you! I’m so glad I’m not the only one who thinks these thoughts. I would share this with my friend Dayra who seems to feel the same as us. Love, love this book idea! I plan to share it with my friend, Cheryl, who in the middle of dealing with breast cancer still brings me soup when I was sick (that happened today!)! I would give a copy to my best friend! I can’t count the number of times in the last few years that I have heard her talk about how she is too stupid to do things. It breaks my heart and I would love to give her this reminder that she doesn’t have to feel alone and like a failure! So good and needed today! I would give a copy to my friend Marianne, who’s just become a mother of two. This is me! I have many days wanted to quit on being the mama to three boys with special needs with a husband whose job keeps him away a lot! If I won two copies, I’d give the other to a woman in my woman’s group at church who has three boys like mine, but they are younger. I see her struggle and I try to encourage her, because I know she will get through this. 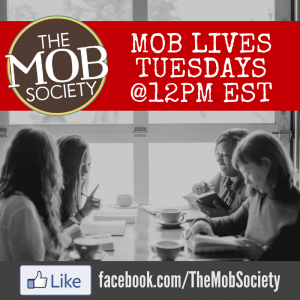 Thank you MOB Society for sharing Renee Swope’s devotion, it was great! I “hopped” from Renee’s blog to yours. If I were to win two of her books I would give the other one to my sister who also has a little boy. I’m so glad I found your blog, just for moms with boys! Just as Renee said, there’s days I want to quit too! Hi! I popped over from Renee’s blog and I am so glad I did, not only for the opportunity to win the devotional but as the mom of an adult son, I have two grandsons that I love, pray for and take care of quite a bit, which I also love. Gonna sign up for email posts if I find it after I comment. Oh and if I were to win, I would give one to my daughter. She is just beginning her journey in true relationship with Jesus. I am sure this will alsohelp her to be a wwoman who is confident in Christ! Thx so much! Hi! You are a new to me blog. Renee Swope sent me. 🙂 I am not a mother yet, but I enjoy reading your posts so I can share them with my sister and friends who are mothers and wives. :)I’d share this with my friend’s wife. She could use this right now esp.